Picky eaters or fussy eaters can certainly present a challenge for parents. Especially parents who want their children to eat a healthy diet! Here are several tips that can help you turn that picky eater around. If the mother answers “yes” to one or both of these questions, I recommend that she read the “Gut and Psychology Syndrome” by Dr. Natasha Campbell-McBride. You can read my GAPS Review and it is important to note that Dr. McBride uses the GAPS diet in her practice with autistic children. Not only has autism been linked to the imbalance of gut bacteria but, so have other behavioural issues. The GAPS diet focuses on returning balance to the gut bacteria. One common characteristic that GAPS patients have it that of being a picky eater! Another is they tend to have allergies or food sensitivities. Assuming that you answered “no” to the two questions above, here are suggestions to help your picky eater. Children are mirrors of us, the parents. If you or your spouse are picky eaters, chances are your children will be too. Try being more open to new foods yourself and train by example. There are only a couple of foods that John (hubby) doesn’t like (turnip greens) and boy do the children pick up on it – they don’t like them either! Eating together as a family is a great time to be a good example of healthy eating habits, not to mention the benefits of just being together as a family. Cook one meal for everyone and have everyone eat together. If you cater to a picky eater by providing a different menu that they will eat, you are only encouraging picky eating! Resist the urge to bribe and offer a treat if they eat the food on their plate. It may seem like a good idea at the time but, in reality, you are setting yourself up for a habit that you will grow tired of quickly. We have expected our children to eat what they were served with an attitude of gratefulness. In writing about the Terrible Twos, I state that children tend to live up to our expectations – good or bad. The same occurs with meal times. If we expect a battle, we will probably get one! While I do expect our children to eat what is served, I am also careful to serve only the amount I think they can handle for their age and size. Everyone is always welcome to seconds! Let them help choose the produce. Those with vibrant colors are powerhouses of nutrition and filled with antioxidants. Speed through the junk food and sweets – or don’t even go down that isle! Our children love helping me in the garden. What’s even better is when I give them a row to plant with their own seeds. Most vegetables are easy to grow. Children enjoy planting, watching them grow, watering and harvesting. It gives a sense of fulfillment that encourages them to eat the products (or produce) of their labor. Our children love to help in the kitchen with food preparation. I know what you are thinking – it goes so much quicker (and neater) if I do it myself! Often, however, the outcome of the experience will depend upon your attitude. You can consider them a hindrance or view their help as useful and fun to have around. It can be a great time of teaching when our attitude is correct. Children love different shapes, as well as, colors. Foods like pancakes, cookies and sandwiches made into animal shape are a big hit. So, use the same strategy with new and healthy food choices. If trying a veggie salad, cut the veggies in pieces and sticks that can be made into a face or other shape on the plate. Use cookie cutters to cut breads into fun shapes. Then, use a healthy filling for a sandwich. Snacking can take the edge off hunger and as a result, you child will not feel the need to eat at mealtimes. Have regularly scheduled meals and only offer snacks if the meal was finished. When snacks are offered, make sure it will not spoil your child’s appetite for the next meal. While it may seem like a never ending battle, don’t give up. Continue to offer new foods or foods they are not crazy about, along with favorites. Variety is the spice of life! Sometimes, children do need encouragement to try new foods. They are often more open to new things if they have had a hand in the preparation. But, don’t underestimate the power of you example as a parent when it comes to eating and new foods – children are mirrors of what they see! Everyone is different and have different tastes. It is important to offer a wide variety of tastes while children are young. Variety also helps give a more balanced diet. All that being said, you are the parent and eating (as with many other things in life) can come down to a matter of obedience. This is part of training. But, not just for obedience, but also for gratefulness that food is provided for them. Children do not have to “love” everything you serve, but they should accept it respectfully and gratefully – it is a matter of character training. 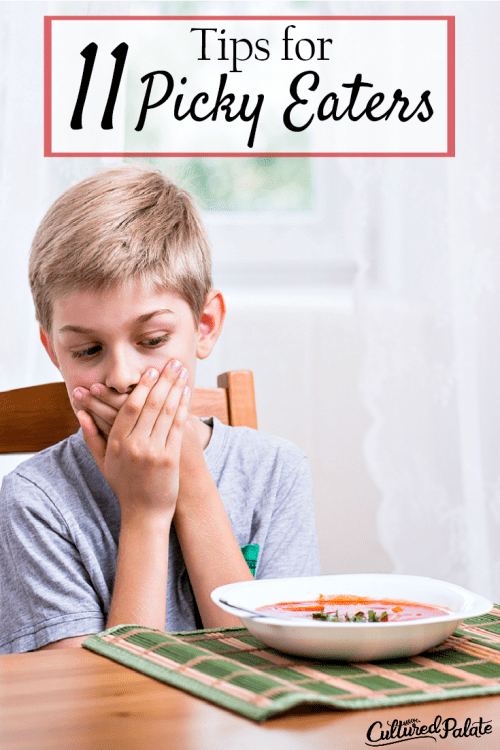 How do you deal with a picky eaters?